How do I block certain days and/or hours? I am creating a form so our customers can request a quote for renting a vehicle. Our office is closed on Sundays and holidays. How do I restrict Sundays from being either keyed in or selected on the pop up calendar? Can time also be restricted? I when thru the settings but it is not working. 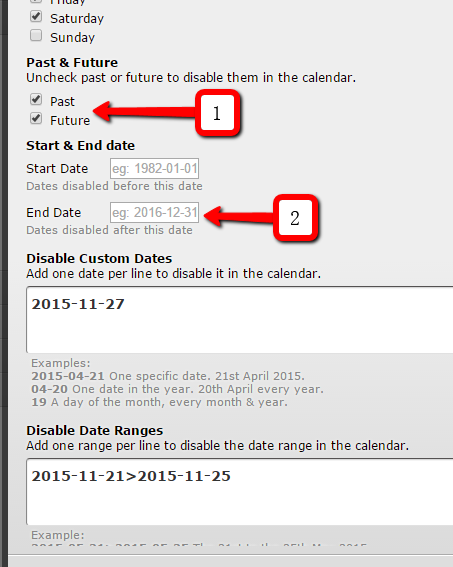 2) In the START & END DATE, you had enabled the end date. This would indicate that the last date available would be this one. Please let us know if this helps resolve your issue.